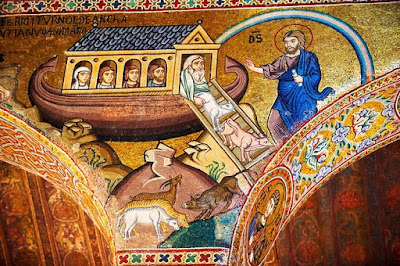 Since the time of the Fathers, Christians have always seen the epic ark of Noah as a type of the Church. Just as the ark was the means by which Noah and his relatives were spared destruction, so also the Church is the instrument by which Christians are saved. The comparison between the two has an explicit biblical foundation in 1 Peter 3, where the apostle writes that the flood itself anticipated the sacrament of baptism. 1. Wood and water. Building on the words of 1 Peter 3, St. Augustine argues that the ark represents the primary means of salvation in the New Testament — the wood of the cross and the waters of baptism by which original sin is washed away (Contra Faustum, Book XII). 2. The door on the side. Noah, his family, and the animals all entered the ark through a door on its side (Genesis 6:16). This is analogous to the way we enter the Church through the side of Christ, which was pierced on the cross, releasing blood and water. “And its having a door made in the side of it certainly signified the wound which was made when the side of the Crucified was pierced with the spear; for by this those who come to Him enter; for thence flowed the sacraments by which those who believe are initiated,” Augustine writes in The City of God. 3. The body of Christ. Even the very ratio of the dimensions of the ark to each other suggest a human body, specifically, the body of Christ, according to Augustine: “For even its very dimensions, in length, breadth, and height, represent the human body in which He came, as it had been foretold. For the length of the human body, from the crown of the head to the sole of the foot, is six times its breadth from side to side, and ten times its depth or thickness, measuring from back to front” (The City of God, Book 15). 5. The decks and stages of the spiritual life. While there was one ark, there were many levels (at least three) within it, which Origen, in his second homily on Genesis, saw as symbolic of the varying progress Christians make in the spiritual life. The fact that there were three itself is noteworthy, as Church tradition often conceives of the spiritual life as progressing in three states: purgative, illuminative, and unitive [or purification, illumination, glorification]. 6. The window above. No detail of the Genesis flood account is insignificant for patristic interpreters like Augustine. For example, in Genesis 6 we are told that, in addition to the door on the side, Noah was instructed to make an “opening” for daylight, presumably near the top of the ark. Then, he was ordered to “finish the ark a cubit about it” (Genesis 6:16). “That the whole ark together is finished in a cubit above; as the Church, the body of Christ gathered into unity, is raised to perfection,” St. Augustine writes in Contra Faustum. 7. Penance, the cross, and Christ. The dimensions of the ark were 300 by 50 by 30 cubits. St. Jerome sees significance to each number. He notes that the Hebrew word for 300 contains a Hebrew letter associated with the cross (because of a prophecy in Ezekiel 9:4) while 50 is a penitential number (because Psalm 50 is penitential). Finally, Christ was 30 when He was baptized and began His ministry. In a sense, these three numbers represent the whole compass of the spiritual life: “Through penance, we arrive at the mystery of the cross; we reach the mystery of the cross through the perfect Word that is Christ” Jerome concludes in Homily 84 (Early Christian Commentaries on Scripture, InterVarsity Press). 8. Sealed in love. No nails were used in the construction of the ark. Instead, it was held together by pitch. 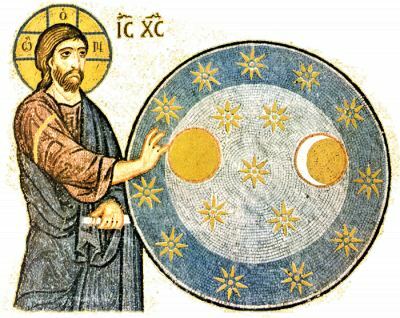 For Augustine, this symbolizes the way in which the Church is held together by love: “For pitch is a glutinous substance, of great energy and force, to represent the ardor of love which, with great power of endurance, bears all things in the maintenance of spiritual communion” (Contra Faustum, Book XII). 9. Built of saints. The shape of the building material is symbolic too, according to Augustine. “And the fact that it was ordered to be made of squared timbers, signifies the immoveable steadiness of the life of the saints; for however you turn a cube, it still stands,” he writes (The City of God, Book 15). 10. God closed the ark. Once Noah, his family, and all the animals are safely in the ark, Genesis 7:16 records this touching detail about who closed the door to the ark: “Then the Lord shut him.” (The Greek version of the Old Testament, the Septuagint, adds at the end of the verse: “from the outside.”) Church Fathers saw this as an example of God’s tender care for men. “Notice in this place too the considerateness in the expression … to teach us that he had ensured the good man’s complete safety,” St. John Chrysostom says in his homilies on Genesis (Early Christian Commentaries on Scripture, InterVarsity Press). Can We Know God Through Mathematics?